Come on out to Sand Pine Pheasants and we will be happy to have you demo the Action TrackChair or you can even use it for a Pheasant hunt. Talk to Keith for more information about demos. Our exclusive patented "Tilt on the Fly" seat adjustment system provides the ultimate in operator comfort. You select the seat angle that fits your preference as you go off the hard surface on the way to your favorite destination. Don't settle for less! 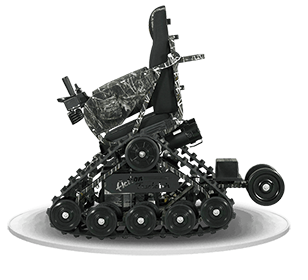 The Action TrackChair difference means that you can select from 5 unique models — 14 different sizes. Pick from 18 color choices at no extra cost. 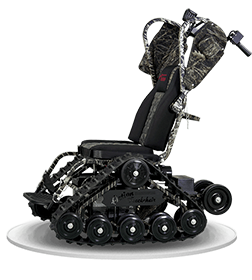 Enjoy over 30 options and accessories that will ensure the TrackChair is customized to your lifestyle. The Action TrackChair is TRULY a life changing device. The power, traction and stability of the Action Trackchairs and Action Trackstanders allow the driver the ability to travel off of the sidewalk or pavement and onto the beach, through the snow, into the woods, granting FREEDOM and INDEPENDENCE that no other chair can.